Often our pets require some form of surgery to treat an underlying problem. Surgery inevitably results in some degree of temporary discomfort for the patient. A major role of the anaesthetist is to ensure management of any pain the patient may be experiencing. One of the most effective ways to do this is use of regional local anaesthetic techniques. The feeling of pain originates from a painful stimulus e.g. surgical incision. This stimulus is passed up towards the spinal cord via sensory nerves. From the spinal cord the signal passes up to the brain where it is recognised as pain. 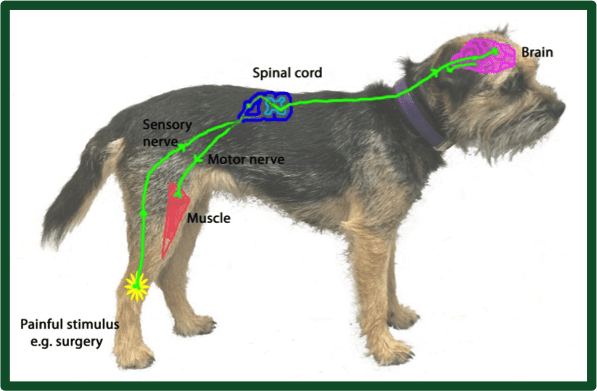 In a conscious animal the brain then tells the spinal cord to send signals via motor nerves to move the muscle. Local anaesthetics are drugs which act on nerves to stop or “block” transmission of information. We often use local anaesthetics to block sensory nerves. This means that the painful stimulus cannot pass up to the brain and the animal does not feel the pain. Local anaesthetics will also affect motor nerves which cause the muscles to move. It can therefore cause temporary inhibition of muscle movement. Some drugs last a number of hours so also provide effective pain relief for the first evening after surgery. Local anaesthetic can be injected around a nerve, often using specialist equipment to allow greater accuracy with injection location. This prevents the nerve from transmitting any pain from the surgical site. The specific nerve chosen to block depends upon where surgery is being performed. This is exactly like what your dentist does prior to performing a filling. Local anaesthetic is administered into the space around the spinal cord. When performing an epidural, we can combine local anaesthetics with other drugs, such as the powerful pain killer morphine.. This can extend the duration of pain relief after surgery. As many nerves leave and enter the spinal cord, an epidural often results in a greater area being affected by the local anaesthetic. This means that both hind limbs often have the benefit of local anaesthetic action. Epidurals are commonly used in people having knee surgery. This allows extended pain relief post operatively. It can be useful where there are large surgical wounds. A catheter is left underneath the skin stitches at the time of surgery. Local anaesthetic can then be administered after surgery to prevent pain from the wound. The catheter may remain in place for a number of days during hospitalisation to ensure patient comfort. Injection of local anaesthetic directly into an uncomfortable joint allows targeted pain relief. This is most commonly performed after an arthroscopy (camera in the joint) although may also be beneficial in other situations. 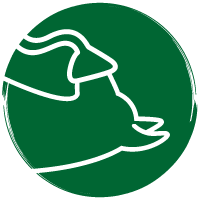 Use of local anaesthetic is extremely valuable for providing pain relief for animals undergoing surgery. The local anaesthetic technique recommended depends on the individual patient and their procedure. No technique is risk free, but these are generally considered minimal, especially given all of the benefits their use offers.